The Champions League returns this week and brings us an extraordinary fixture between two of the most prestigious clubs in the world, Chelsea and Psg. Both teams are going through very different moments in their national championships: as lonng as Psg is the indisputed leader of the League 1, Chelsea is trying to aim the Europe League positions. However, the Champions League might be a turning point for the “Blues”. Although Chelsea needs to get back in the adverse score that it got in Psg´s stadium, the team from London is full of extraordinary players able to score anytime. Moreover, the “Blues” will be able to take advantage of its fans who will encourage them to take the victory. Psg, on the other hand, will do its best to defend the fantastic score that it got on its stadium! Enjoy this amazing match and the entire competition with Betfair and its fantastic promotions!! For this fixture, Betfair offers its the great opportunitty to make money betting on both teams!! If you want to know more about this fantastic odds, keep reading! If you want to get this Betfair promotion you only need to open a new customer account using the promo code ZFBC75 – only one account per customer. 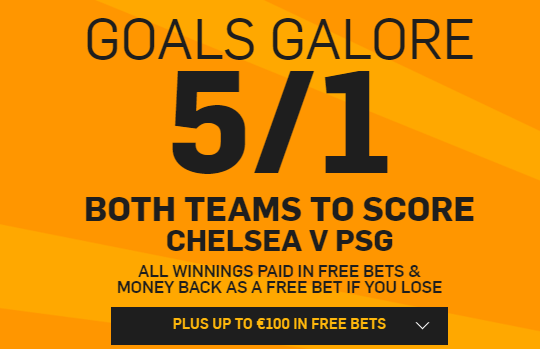 After that you have to place a pre-match bet of £/€10 (maximum stake) on Chelsea to win at 8/1 or PSG to win at 8/1 in the ‘Match Odds’ market. As you can see getting this promotion is very simple. But also there is more! For every 5 x £10 bets placed and settled, receive a £20 free bet (£100 max bonus in free bets). You will also receive up to £/€10 as a free bet if your bet loses. And if your bet is succesful Betfair will payout your winnings enterely in free bets within 24 hours! Moreover, if you are not very sure about which team will take the victory, you can also bet on ‘Both teams to score’. Open a new Betfair customer account using the promo code ZFBC74. After that, you only need to place a pre-match bet of at least £/€10! Remeber that if your bet lose Betfair will give money back and that you can get £20 free bet! Enjoy the Champions League with Betfair! It is important to know that only your first bet placed on the event is eligible. Moreover exchange bets and bets as part of multiples are not included in this promotion. Please, note that selections in permutation multiple bets (Patent, Yankee, Lucky 15 etc) do not count and bets placed using free bet tokens as the stake (in full or in part) will not qualify.